Discussion in 'Parapsychology' started by Beer w/Straw, Oct 29, 2018. Because you can try to imagine a life totally different. I could never picture myself as a sheriff, and if by chance I was one, maybe it would be cool to distance myself from the reality of the job? It has long been rumored that Corey placed a curse on Salem and its sheriff during his torture by shouting “Damn you! I curse you and Salem!” at the sheriff before he died. Four years after Corey’s death, Sheriff Corwin died suddenly of a heart attack at just 30 years old. 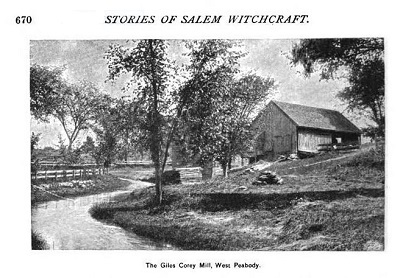 Local legend suggests that Corey not only cursed Corwin but every Salem sheriff since 1692. Kinda sounds suspiciously like karma, though? And if you wanted to waste 6 minutes of your life. Don't all sheriffs die of something? Why do you say Bless you after you sneeze? One of the symptoms of the plague was coughing and sneezing, and it is believed that Pope Gregory I (Gregory the Great) suggested saying “God bless you” after a person sneezed in hopes that this prayer would protect them from an otherwise certain death. The expression may have also originated from superstition. But really have no clue. It was once believed that the soul temporarily left the body when a person sneezed. Blessing the sneezer was alleged to prevent a demon or the devil from taking charge before the soul could return. That was interesting, was this Corey one of the Salem witches then? So be careful not to sneeze over your left shoulder because the Devil is sitting there. Learning, and new borns are curses. When we can be knowing, and be loving. Learning, and new borns are curses. Indeed. I once had an old Gypsy Lady stick me with a textbook on the Fundamentals of Algebra and a 1-day old baby. To this day, I still carry them around, unable to break the curse. I wouldn't know, but maybe he was cursed with bad genes from his lineage?? One could conceive _X_ data either way, according to differing contexts of either strict standards of a profession or the fluid liberties of a personal thought orientation. Probability as tool for exposing a string of supposedly related events as a faux pattern/meaning. Or recruiting probability as a smoke-screen for anonymously smuggling metempirical influences into a natural model of the world. Statistically, there are eventually going to be "bad luck" events that can be mapped to an unusually extended sequence for whatever select category. Just as planet Earth itself is an example of the opposite: A very long timeline of "good luck" in terms of not only remaining biologically viable but even producing an intelligent species -- both surviving and dodging various mega-disasters which doom most of the initially promising planetary candidates in the galaxy to lifelessness. Digging around in history, something discovered via either arbitrary search or cognitive bias can be found to pin blame on for what's later conceived as a "cursed series". Just as Earth's prolonged "winning" streak might be imaginatively construed and personified as a guardian watching over it. Each generation seems to deem law enforcement as experiencing unique upticks in heart conditions, stress-related high blood pressure, and other ailments. When instead it's likely a universal or general "regardless of time" side-effect which comes with the occupation.